Trevor Hambley is Professor of Chemistry at the University of Sydney's School of Chemistry. He has studied and worked at the Universities of Western Australia (BSc Hons(I)) and Adelaide (PhD), ANU, The University of Sydney, Emory University and Birkbeck College, University of London. His research interests are in the area of medicinal inorganic chemistry with an emphasis on platinum anticancer drugs, hypoxia selective cobalt complexes, and metal based anti-inflammatory compounds. He has published 3 books, 13 reviews, and more than 400 refereed journal papers, including four recent reviews of the relationship between the structure of Pt anticancer agents and their toxicity and anticancer activity and on the modelling of Pt/DNA interactions. 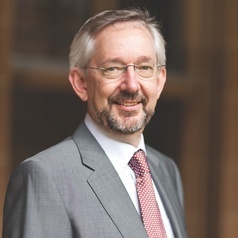 Professor Hambley was the recipient of the Edgeworth David Medal for contributions to Science by an Australian under the age of 35 and has received the “Supervisor of the Year” award at the University of Sydney in 1997 and an Excellence in Teaching Award for Postgraduate Supervision in 1998.